It seems like the Oklahoma City Thunder are just regressing with every passing game. 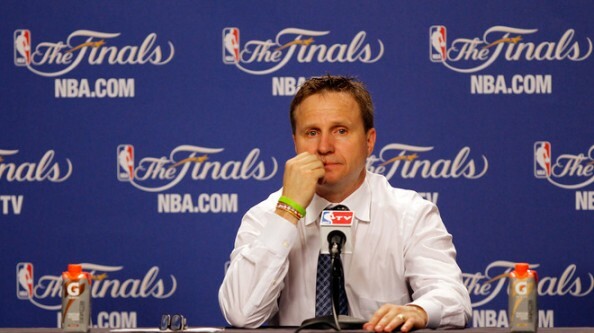 Scott Brooks finds it harder and harder to explain why his team threw another game. The Miami Heat keep on moving forward with the same game plan, with more and more guys stepping up each time. 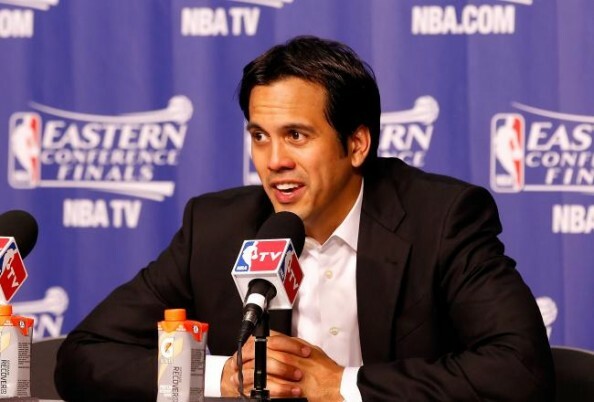 Erik Spoelstra, definitely on the hot seat in these playoffs, is a big part of why LeBron James is one win away from his first NBA Title. All the talk of the young legs and superior offensive talent the Thunder have went down the drain. The Miami Heat are playing the same way through the entire series, and except for letting Game 2 slip away after Kevin Durant took over, their dominating from top to bottom. There are the down moments, that usually happen when Thabo Sefolosha gets a hold of LeBron James and manages to keep him out of the paint for a while, but that never lasts for too long. James either figures out a way to be productive again, or other Miami Heat players knock down their shots – Shane Battier in the first two games, Mario Chalmers in Game 4, Dwayne Wade picking up his game and Chris Bosh contributing in more than just points. Sefolosha isn’t doing himself any favors by simply playing terribly on offense. Brooks got a lot of credit for making the right kind of adjustments in the series with the San Antonio Spurs. It isn’t happening. Not just because of his players making bad plays on the court. He’s making bad choices. Kendrick Perkins continues to look more and more irrelavent. James Harden is making mistake after mistake on both ends of the floor. Derek Fisher plays 22 minutes but gets only one shot. Fisher isn’t on the floor to grab rebounds or dish out assists. He’s there to get screen, wait in the corner and knock down three pointers. The Miami Heat made a conscious decision to let Kevin Durant and Russell Westbrook try and beat them on their own. They’re rotating defenders on Durant, not letting just LeBron try and keep the NBA’s best scorer over the last three seasons at bay. Russell Westbrook kept blowing by whoever was guarding him, but 20-32 nights don’t happen often. He didn’t find open men, and the Heat could live with Durant and Westbrook scoring over 70% of the Thunder’s points. The rest? James Harden is frustrated and keeps taking bad shots or tries to penetrate, hitting brick walls time and time again. The Heat’s defensive rotations are back to their premier form once again. The Thunder are hardly doing any drawn up plays as is. Hardly any screens and pick n’ roll moves. Just Durant trying to get the ball in comfortable positions. Just Westbrook trying to blow by his defender or pull up for those ‘surprising’ jumpers. On the offensive side, it looks like there’s enough confidence instilled in the role players. Mario Chalmers isn’t afraid to take shots – He was 9-15 from the field in Game 4, scoring 12 of his 25 points in the fourth quarter. There’s no waiting around for LeBron James and Dwyane Wade to pull rabbits out of the hat. This series and the previous one showed that Heat players can step up; Can score in double digits when given the opportunity. LeBron James is playing one hell of a series, but in Game 4, more than ever, it wasn’t all about him. What is there left to do? Brooks and Durant spoke of it being tough and frustrating, but they need to keep fighting. The Heat are speaking of staying the course, staying aggressive. We’ve been hearing the ‘keep fighting’ stuff from the Thunder for three games now. It’s not that they’re not playing hard, or hard enough. But they keep making bad decisions, like Westbrook’s foul on Chalmers with 13 second left, or every time James Harden touches the ball, when it matters the most. Their coach, somehow caught up in a losing battle while having the more talented team, is just as much to blame as his players are.